Koh Rang, the uninhabited 12 island group at the centre of the Marine Park, is situated well over an hour out from Bang Bao on Koh Chang and just to the west of Koh Mak. 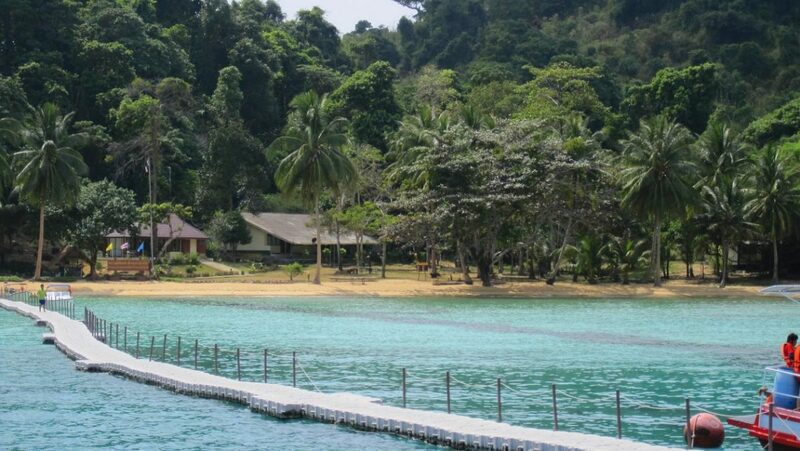 The main island has a ranger station, a couple of bungalows and a very passable restaurant, with toilet and washing facilities for overnight camping. 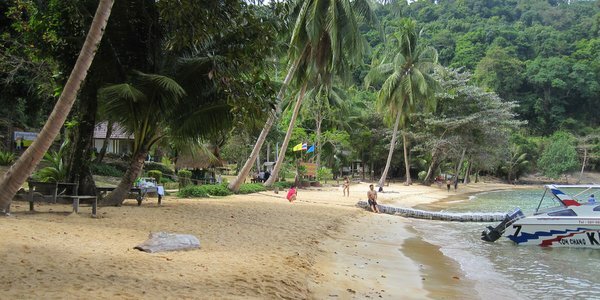 Accommodation can be booked from Koh Chang, though people staying is a rarity. The best beach on Koh Rang is at the south eastern tip, with another popular spot in the north west, and rougher strands along the eastern shore. The islands scattered around Koh Rang are in 3 distinct groups. In the east and south east of Koh Rang, Koh Laun (sometimes referred to as Koh Yak Lek), Koh Yak and further south, Koh Mapring are combined with the very pretty beach at the southern end of Koh Rang to make up one of the main snorkeling areas. 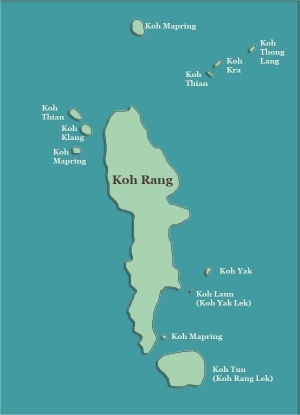 To the north west, that name again, Koh Mapring, which sits alongside Koh Klang and another Koh Thian form the second grouping. The smaller speedboats tend to call in here, so that people can have lunch on the beach, again on Koh Rang itself. In the north east of Koh Rang, Koh Thong Lang, Koh Kra and Koh Thian were also a principal and very popular destination for the snorkeling trips, but the degeneration of their coral, bleaching in particular, has forced the Marine Park authorities to place the islands off limits. Please click on the Koh Rang map to expand. To visit Koh Rang, there are either snorkeling trips or Koh Chang diving days. All details are found on those pages on the many different trips available including very popular private tours. We can put everything in place for you, so please just get in contact. From Koh Mak, the more adventurous can kayak but there are organised tours too, details in Koh Mak Diving and snorkeling. Koh Rang has a government tax of 200bt per person, 100bt for kids levied on all visitors. This is collected by the snorkel and diving boats either before you leave or on the boat. It is an additional cost to their advertised daily rates. Contact Us Now for a quotation - private boat trips, speedboat, wooden boat, no party too small or too large. Snorkeling, easy fishing, buffets, transfers.